Tooth whitening and cosmetic surgery are cosmetic issues that interest both women and men. People appreciate a beautiful smile as this is an important part of human communication. There is a branch of dentistry that deals with cosmetic issues. Teeth are very visible when a person smiles (particularly the front teeth). There can be gaps between the teeth that are genetically determined. Other factors are from lifestyles such as smoking that is one of the most common causes of discoloration of the enamel of teeth. But aging and exposure to food pigments also leads to a yellowing of teeth. In children whose mothers were exposed to tetracycline during the tooth forming period in their pregnancy will have darkened teeth in the first set of teeth until the age of 9 years. It is rare that the permanent teeth are affected. What are the methods used? This can be used in the office setting supervised by a dentist or at home by home treatment. Not every person is a candidate for this and if you can afford the cost, the professional approach may be best for you. Both approaches are very effective and are about equal in the final result. If you had a lot of dental work done with different types of fillings, the dentist supervised whitening may be best for you or the dentist may advise that you are not a candidate at all. Keep in mind that any dental work including crowns, fillings or repairs with porcelain, amalgam etc. will not whiten. You may end up looking spotty as the normal enamel will whiten but the previous dental work will stay with its color shade. A dentist will whiten your teeth for upward of 1000$. The dentist uses 15 to 35 percent hydrogen peroxide gels and combines this usually with high intensity light to expedite the bleaching process. On the other hand the home whitening kits range between 10$ and 35$ per kit. The over the counter preparations contain 10% of carbamide or hydrogen peroxide. Carbamide breaks down in the mouth into hydrogen peroxide and urea, so essentially all of the whitening action comes from the hydrogen peroxide. The stains from smoking, from consumption of stained foods like red wine, black tea, coffee etc. or some of the yellowing from aging will be bleached by putting the shine back on the enamel crystals. 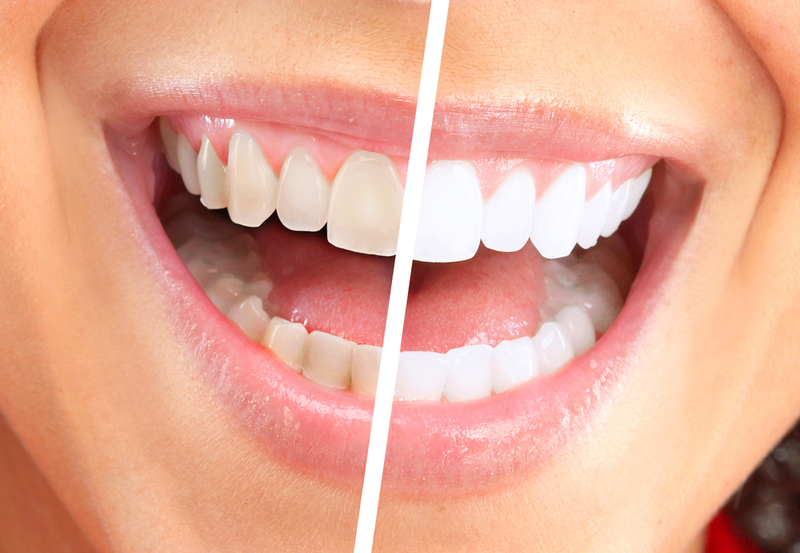 Regardless of the method employed of the tooth whitening, the effect will lasts for about 5 years. 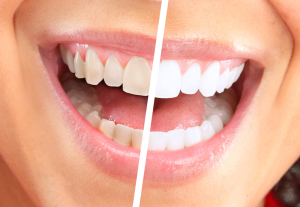 Long term studies have shown that the home bleaching method using 10% of carbamide or hydrogen peroxide is the safest method causing no harm to the enamel of the tooth. The more concentrated bleaching in the dentist’s office can lead to porous enamel, which may cause dental decay down the road, and it also tends to irritate the gums more. The dentist can counteract the gum irritation with fluoride additions. Other products are whitening strips, which are very effective and whitening toothpaste, which is about moderately effective. Paint-on whitening, which consists of titanium dioxide is not very effective and you may perhaps consider this a waste of your money. Some people were born with less attractive looking teeth than others. There may be unsightly irregular gaps between the front teeth or partially rotated teeth. Whitening will not take care of these structural changes, but they often affect the owner’s emotional wellbeing significantly. The cosmetic dentist can make a difference here. This has been well publicized in TV series as “extreme makeovers”. No wonder, as the difference between before and after tooth appearances can be as impressive as a facelift! Porcelain veneers are the most popular ones of the cosmetic dentistry procedures. If teeth are discolored or stained or if there are unequal gaps, these can all be remedied with this procedure. It consists of porcelain wafers that are custom-made and fitted usually for the upper six teeth. They are matched in color and shape to the lower front teeth. The dentist removes the upper enamel layer of the teeth to be veneered. Within two weeks during which the patient wears temporary veneers, the custom made veneers are ready to be placed permanently. The cost per veneer application is about 500 to 900 dollars per tooth, so for six teeth the bill could be 3000$ to 5400$. When there are minor inequalities of height of neighboring teeth, this can be equalized by shaving a small amount of enamel off the tooth that is too long. This is tolerated well and only rarely leads to a slight hypersensitive for a period of time, but this responds to prescription strength fluoride for a period of time. The cost per tooth is about 30$ to 80$.